The Alma Mater: What Would ‘Rock’ Do? Exposed? Exposed to what, exactly? Exposed to a wonderful tradition in which Notre Dame students—football player or not—pledge their honor to the greater good for which they strive as members of this University family? At the same time, Rockne realized that football was a means to an end, not an end in itself. The end was developing teenagers into strong, capable young men who could think on their feet, act on their own, and choose to do the right thing. Rockne “exposed” his players to the public for hours on end during long train trips to far-flung locations where games were played. They were expected to act like gentlemen, and from all accounts, they did on nearly every occasion. I think Rockne would also recognize the “cleansing” nature of joining with fellow students to honor the school’s foundations. He’d realize it’s a moment to come together and say, win or lose, we’re in this together, and we go together. Viewed one way, the singing is the first step in preparing for the next opportunity to represent Notre Dame. The special charm of Notre Dame football has always been that the school is represented by true students, who live, learn, study, eat, and pray among their fellow students. 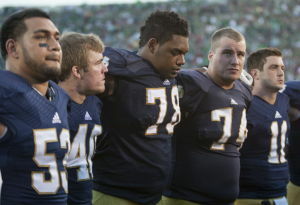 Any effort to diminish that special bond—and this isn’t the only one—tarnishes what has made Notre Dame football unique. I think the only thing that’s been exposed is some questionable coach-think.